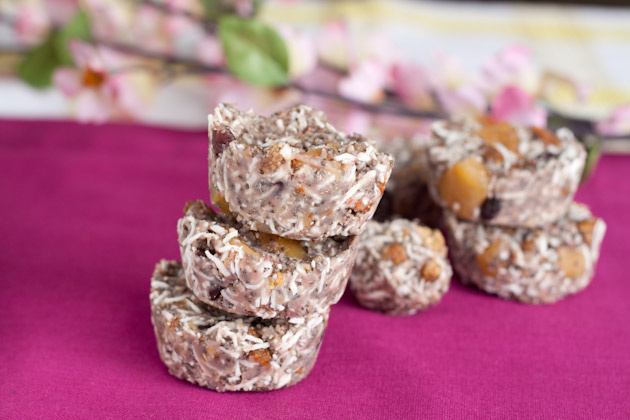 Pump up your healthy fats with this no bake treat! My favorite way to enjoy them is 1 minute out of the freezer as a super chewy and satisfying snack. Place cashews and coconut oil in the bowl of a processor and process until smooth. It will take about 6-8 minutes and you’ll have to scrape down the bowl a couple of times. Meanwhile, combine dried fruit, chia seed, coconut, and quinoa flakes in a large bowl. Once cashew butter is complete, add raspberry jam, vanilla, and lemon rind. Pulse to combine. 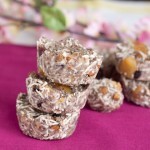 Drop cashew mixture into dried fruit + nut bowl and stir until combined. Spoon mixture into large muffin liners or a muffin tin, pressing down firmly on each one, flattening with hands. To make paleo, or grain free, use ground nuts like almonds or extra coconut instead of quinoa flakes.